The Garmin fenix 5 has now new software that is welcomed by many users. With basic improvements to the user interface and new metrics to indicate performance trends, the fenix 5 adds another level of usability and fitness tracking. Although the looks haven’t changed dramatically from the fenix 3, the fenix 5 still retains the same legendary build we’ve all come to love. If you’re coming from Fitness Bands then you’ll be exceptionally happy with the ruggedness of the fenix 5. Another new feature that we absolutely love is Garmin’s new QuickFit system accessory bands. With the fenix 5 being an all round watch, not just for training, you can switch your look from sport to formal with two simple clicks. With the addition of the fenix 5S to the range, it’s awesome to still have optical HR in such a small package. With a slimmer profile and improved software to increase accuracy and reduce battery drain, the optical HR can track your movements 24/7. If you’re an avid explorer then mapping on the Garmin fenix 5X will be one your favorite features of the new range. With mapping assisting with trail runs, hiking, running, cycling, city exploring and navigation, you’ll be able to plan the best routes and never get lost. 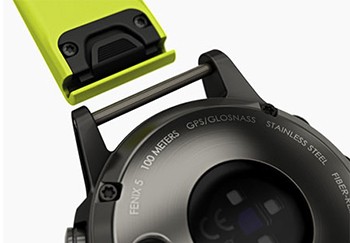 One of my favourite features of the fenix line is the functionality included to help you through your day. With smart notifications and control of your phone, you can answer phone calls without having to run to your phone. Other all day usability features include, general activity tracking to make sure your healthy away from the gym and training. With a step counter, calorie counter, sleep counter these tracking abilities provide a bigger picture for your health. The post 5 Reasons To Buy the Garmin fenix 5 appeared first on Highly Tuned Athletes.